Data compiled by a research firm provides some insight into who is likely to cast a ballot today. PUNA, HAWAII — A lot has been said this week about the voters in Puna who will ultimately decide the race between U.S. Sen. Brian Schatz and U.S. Rep. Colleen Hanabusa. Here’s what we can tell you about these Big Island residents based on an analysis of voter records and past election data compiled for Civil Beat by a research firm. They’re mostly white, the women outvote the men and a large percentage usually doesn’t bother to vote at all. There are more than 8,200 registered voters in the two Puna precincts that were closed for the Aug. 9 primary due to Tropical Storm Iselle. 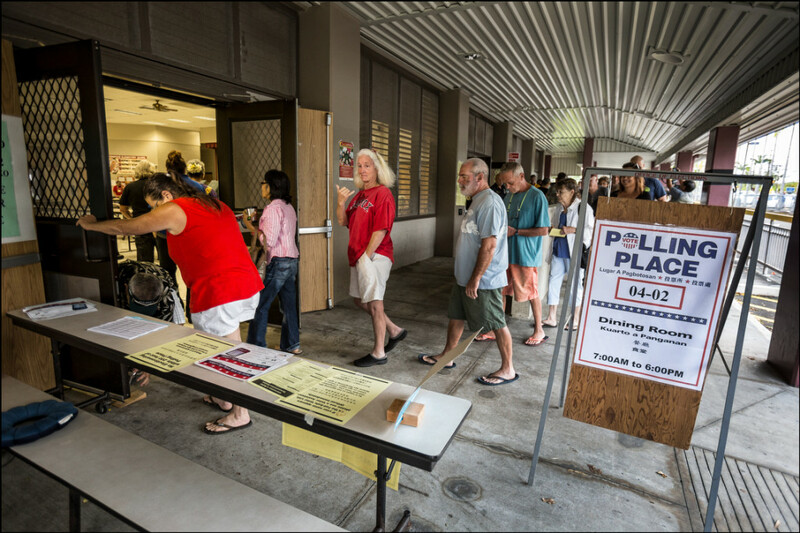 The doors opened for voters at Keonepoko Elememtary School in Puna at 7 a.m. Friday. Of those, election data shows about 70 percent are in the H4-01 precinct that was supposed to vote at the Hawaiian Paradise Park Community Center. The remaining voters are in the HD4-02 precinct and were scheduled to cast ballots at Keonepoko Elementary School in the Hawaiian Beaches neighborhood. That’s where Friday’s vote is taking place for both precincts. Almost 5,000 potential voters are white, meaning they make up 60 percent of the voting bloc. 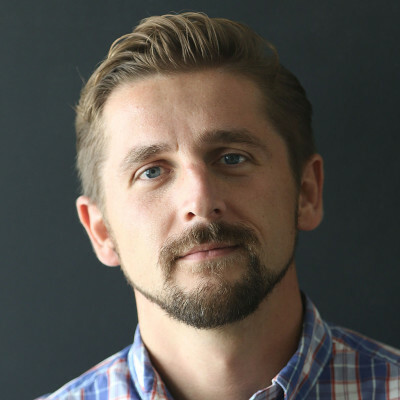 Matt Fitch, executive director of the Merriman River Group that conducts Civil Beat’s polls, says this is significant given that the statewide percent of white voters is closer to 40 percent. Historically, women in the two precincts vote more than men, and have done so in every election going back to 2004. For instance, in the 2012 general election in which Barack Obama and Mitt Romney were on the ballot, about 2,600 women voted compared to 2,300 men. Rep. Colleen Hanabusa waves to potential voters Friday. But that 10 percent gap isn’t that significant, at least in the race between Hanabusa and Schatz, as polling data indicates that ethnicity, not gender, is what’s influencing the numbers. What sticks out in the numbers is that more than 4,000 voters have never voted in a primary election this century. This won’t be helpful for Hanabusa, who already trails Schatz by 1,635 votes. In order to pass him, Fitch says she’ll need to win the Puna precincts in a landslide. Not only does Hanabusa need a huge percentage of people voting for her, Fitch said, she also needs high voter turnout. If trends continue and voter turnout remains low, her potential pool of supporters will be small. Schatz has already won the other two Puna precincts, HD4-03 and HD4-04, and many other ballots have already been cast by early walk-in and by mail in the precincts voting Friday. There’s reason to believe more people will vote in Friday’s election than usual as a result of the intense focus on Puna over the past week. And on Friday morning the polling place was crowded. The area was hit hardest by Tropical Storm Iselle, which made landfall on the Big Island the day before the Aug. 9 primary. Once Hanabusa and Schatz realized their political careers depended on the voters of this rural district south of Hilo, they swept in to help with relief efforts. 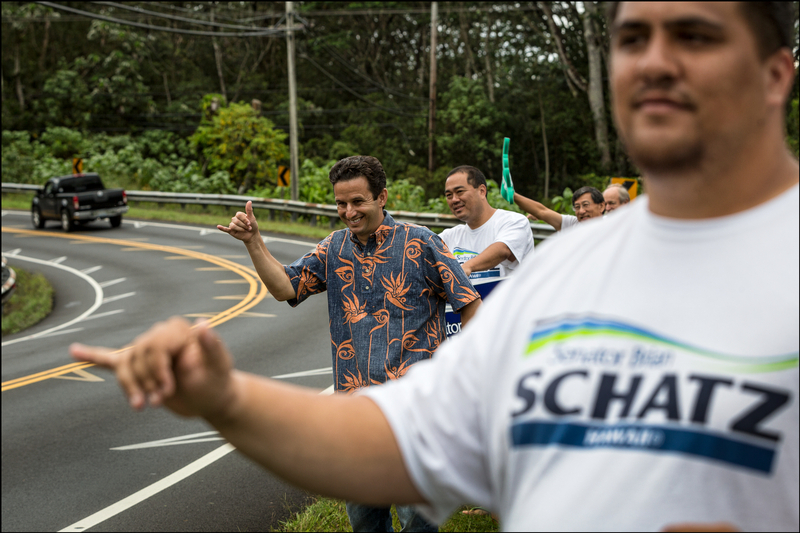 Sen. Brian Schatz and supporters wave to motorists near Keonepoko Elementary School on Friday. Both have spent recent days handing out supplies, such as food, water and ice, to those who were stranded and without power. The candidates said they were participating in humanitarian relief efforts, but it was clear that they were also looking for votes. 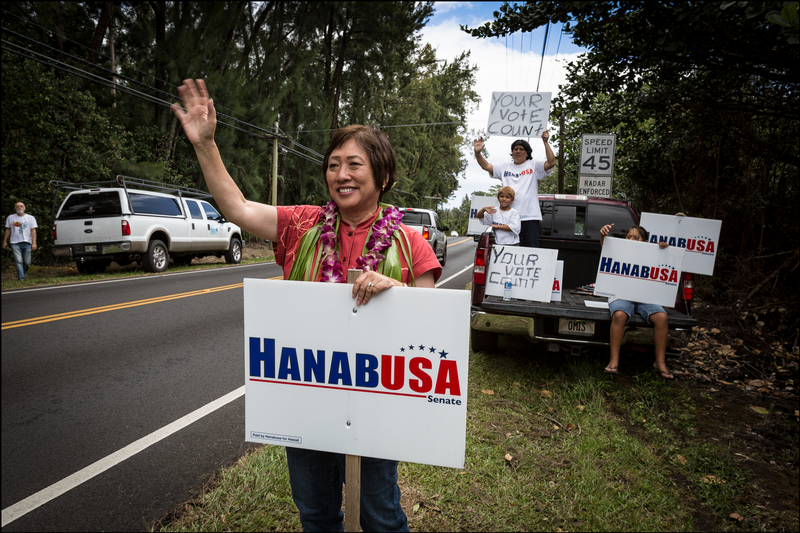 Hanabusa set up a volunteer station where people in campaign T-shirts handed out chili, water and ice. Canvassers flew in from Oahu to help knock on doors and get people to the polls. Schatz took a different tack. Unlike Hanabusa — who had filed a lawsuit in a failed attempt to stop the election from taking place Friday — he refused to campaign or talk to the media. The senator only started sign-waving on Friday’s makeshift Election Day. We’ll know soon whose efforts paid off.